Who do you skate with, other girls or do you skate with guys? Sometimes I skate alone and other times I skate with my friend Mike. Do you skate street, vert, parks, etc.? I like to skate both street and vert but I like street better because I think it's more interesting and technical. Any injuries you've sustained? You know whatthe worst injury that I have had was a broken finger. I've had some really nasty bruises though; I'm talking bigger than my hand, totally black and blue, right on the side of my leg. The rest have been just scrapes. Do you have a favorite pro? Ryan Sheckler. He's an AM but he's awesome. What other things do you like to do? I like water polo and swimming. I like to scare peopleyou know pop out from behind wallsI get a kick out of that. I like playing video gamesI know it's dumb but I like it. ummm you know what I likeShel Silverstine books. They're not story books they are poem booksI like reading thoughts. Less Than Jake, Mellincollin, Crash Palace, Good Charlotte. Well I plan to go to college. I'm still not sure what I want to study or do with my life yet but Ii'm sure it will come to me. I hope! Oh of course I'll still be skating; who would give that up. What advice would you offer other girls who want to start skating? Ummm just to stick with it and enjoy yourself. Ani, thank you so much for sharing your pics and bio with Gurlz on Boardz. You have played an important part in the recognition of women skateboarders. 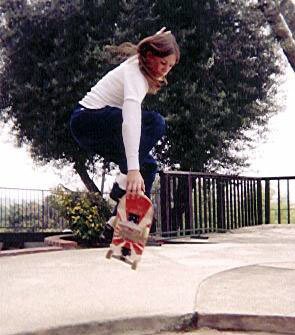 Please keep in touch with Real Skate always; you rock kiddo! Real Skate Copyright © 1999-2003 by Clarkie, Santa Cruz, CA. All rights reserved. No part of this publication may be reproduced by any means; electronic, mechanical, photocopy, or otherwise without the prior written permission of the copyright owner, photographers, writers, or artists named herein. Trademarks mentioned herein are the property of their respective owners. (What this means is, Please Don't Steal! ).